We all know how important a website is to a business's online strategy, but what does it really take to have a great website that drives visitors, converts leads and builds revenue? 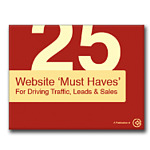 This free, 53-page guide is the ultimate resource to having a killer website that performs. Websites alone will never compete. However, with a complete inbound marketing strategy, your website can be constructed to attract more visitors, convert more visitors into engaged prospects and then convert prospects into valued and loyal new customers.